The majority of the articles that I write for my website stem from my desire to clarify misconceptions, and/or address issues that fountain pen users often confront when they may not have all the necessary information to make a good decision. This one is no exception. Please note – I am keeping the focus of this article to modern German-made #6 or #5 steel nibs. There are plenty of vintage steel nibs that offer qualities that modern steel nibs do not. There are also plenty of steel dip nibs that also offer very different qualities. In addition, some Japanese specialty nibs are completely different than what I am presenting within. Please only regard modern German-made #6 or #5 nibs for the purposes of the following article. This article stems from a conversation that happens at least on a weekly basis with my clients. While discussing a custom order with a client, the client would like to have my opinion as to whether or not they should spend the extra money on a solid gold nib. Since the price of gold has gone crazy in the last five years, this becomes a very legitimate issue. Nib manufacturers and penmakers are having to raise prices significantly on their gold offerings, creating a very large differential between their steel and gold nibbed pens. I certainly don’t mind selling gold nibs, but my answer is always the same, and it goes something like this…. I always offer my clients the opportunity to upgrade their steel nib to gold at a later date if they are not happy, with a credit for the steel nib towards the gold nib. 95% of the time, my clients are perfectly happy with the steel nib, and never consider the upgrade. The only exception is when a client wants their nib to be more flexible. Steel as a fountain pen nib material seems to have received a bad reputation. Sometimes this is legitimate, and sometimes this is not warranted at all. The reasons that steel as a nib material has received this reputation, in my opinion, stems from a couple of items: Experiences with low-quality steel nibs, and a general belief that a great pen cannot be had with a steel nib. Before getting into the reasons that steel has received this bad reputation, allow me to state the differences and similarities between steel nibs and solid gold nibs. Besides price, the biggest difference between modern steel nibs and modern gold nibs is flex. Flex occurs when more downward pressure is added to the nib, causing the tines to spread. This spreading of the tines will lead to a wider line with more ink onto to the paper. So by pressing a little harder, the line becomes wider, causing variation. Modern steel nibs are made from stainless steel and are either left as polished steel, or plated in gold, typically. Due to the rigidity of stainless steel, these nibs offer very little or no flexibility and line variation. Since solid gold is a softer material than stainless steel, the tines can spread much farther than steel, giving more variation in line. 14k nibs offer some flex. 18k nibs offer even more. Gold nibs can be altered to add even more flex by thinning the underside, along with other methods. I find that 14k nibs react to this thinning much better than 18k. The range of flex, whether it’s a stock gold nib, or an altered flexible gold nib is nice, and needs to be experienced to appreciate and evaluate the significance. If you generally write at a fast pace, a flexible nib may be lost on you. Writers that really exploit all of the offerings of a flexible gold nib usually write slowly, deliberately, and will carefully determine when they will push to create the nice line variation, creating a more appealing script. The pen user needs to evaluate whether or not this added flexibility and line variation is worth the difference in cost. Some people will argue that gold is less susceptible to corrosion than steel, and this is correct, but probably not very relevant to modern nibs. This was probably much more of an issue with vintage pens. Decades ago, there were two factors relating to this. The steel alloys were not as resistant to corrosion as modern stainless steel, and inks were probably more harsh. With today’s stainless steel being fairly bulletproof, and most modern inks also being relatively gentle, it would take a very, very long time to actually corrode the nib significantly. Actually, the feed would probably realize a lot more detriment before the nib. And remember that the same feeds are used with gold-nibbed pens. To me, this argument doesn’t hold much water. Even if you did allow a steel nib to be corroded by a harsh ink or poor care, it would only cost $25 to replace said nib. Would you be heartbroken by this? Probably not. Yes, a gold nib will resist corrosion better than a steel nib, but this really only becomes an issue in extreme cases. Personally, I wouldn’t base my choice of nib materials on this corrosion issue unless you have a habit of inking up a pen and then allowing it to sit dormant for a year or longer (which should never happen to a fountain pen). Next, I will try to tackle a subject that is difficult to put into words. There is a difference in “feel” between modern steel and gold nibs, albeit subtle. This difference is independent of the writer’s intent to cause line variation with flex. Because a gold nib will flex, the nib might have a little more “give” as one writes. Even though someone is not trying to write with the line variation that flex offers, a gold nib gives less resistance when the writer varies pressure through their normal handwriting, regardless of writing pace, or an intent to add flex. This can translate into a slightly “less resistant” feel to vertical pressure. The difference is slight, but it’s there. The user needs to decide if this is something that is worth the extra cost of a gold nib. How are gold and steel nibs similar? The biggest and most important aspect is the iridium tip. Gold and steel nibs of top quality are tipped with the same iridium (although the tipping material is rarely actually iridium…refer to my IPG Nib Article for more explanation regarding this issue). So what does this mean? The smoothness, feedback, tooth, flow, along with every aspect about a steel nib relating to the tip, can be absolutely identical to a gold nib, since the tipping material is the same. The difference is the material behind the iridium. With gold, this difference amounts to the ability to flex and spread the tines. Can a steel nib be just as smooth as a gold nib? Yes. Can it offer the same feel? Absolutely, with the exception of the feeling that flex offers. There are certainly low quality steel nibs out there. Nibs manufactured in China, Taiwan, and India are usually of poor quality, as opposed to nibs made in Germany. The tines are rarely aligned, the plating is poor, and the iridium is pretty soft. If a fountain pen user tries one of these nibs, the experience is usually also poor. This can certainly make an impression, and it might make people assume that every steel nib is poor. After all, they are inexpensive, right? You get what you pay for, right? Yes and no. To complicate the issue, most steel nibs, regardless of the country of origin, have an “IPG”, or “Iridium Point Germany” stamp. The Chinese, Taiwanese, Indian, AND GERMAN-made nibs oftentimes have the same stamp (although the German companies are finally getting away from this). Since it is difficult to distinguish the origin of a nib, and most steel nibs have this stamp, it can be easy and sometimes understandable to lump them all into the “poor” category. Please refer to the aforementioned IPG Nib article for more information. I will not address the issues already covered in this article here. The most important point to be gleaned from the IPG article is to realize that the IPG stamp can be deceptive, and has no bearing on quality. The nibs made in China, Taiwan, and India are of poorer quality than the nibs made in Germany. If a pen manufacturer is not forthcoming with the origin of their nibs, then it becomes the consumer’s responsibility to determine the quality, and the article above will help you do this. The next item to address is the fact that many people feel that a top-quality pen cannot be had with a steel nib. I will surmise that this comes from misconceptions about price. Pens manufactured at a retail price of $250 or more will usually have a gold nib. This alone has probably led to a feeling that “true” quality cannot be had without gold. People oftentimes feel that quality correlates with price, and this is not always the case. Consider that the current high price of gold will certainly drive a higher retail price of gold-nibbed pens. Obviously, the cost of steel is not affected by this. A gold nib can mean a $100 to $200 differential between the cost of an identical pen with a steel nib. If someone believes that quality is dependent upon price, then they may be deceived in this situation. Especially if they don’t care about flex. Some people feel that it is blasphemous to have a pen worth $250 or more that has a steel nib. I wholeheartedly disagree, unless flex is paramount. One of my favorite pens retails for around $400. I recently sold the gold nib for $100, and replaced it with a steel nib that I ground to a cursive italic and it’s still one of my favorite pens. Without a doubt, this pen comes equipped with one of the best quality gold nibs that I’ve ever written with, but for me personally, the experience that the gold nib offered was not worth the $100, with this particular pen. 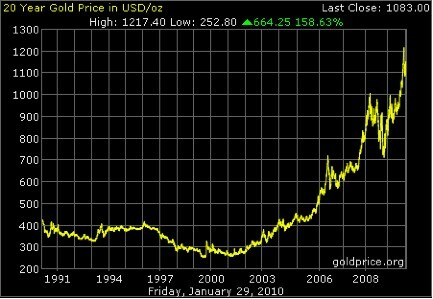 Below is a graph showing the price of gold over the past 20 years. Clearly, gold has skyrocketed. When it comes to pricing nibs, the nib and pen manufacturers absolutely have to see a profit, and with gold at an all time high, this will affect the retail price of a pen in a very big way. If the differential between a steel nibbed pen and an identical gold nibbed pen is $100 to $200 due largely to the price of gold, and the user does not desire flex, steel starts to become a much more attractive way to go. Will a steel nib take all of the same customizations that a gold nib will? Yes, with the exception of flex and re-tipping. A steel nib can be ground to any tip size, and any italic grind, the same as a gold nib. On the other hand, A steel nib will not take flex, and a while a steel nib can be re-tipped, my understanding is that it’s much more difficult than gold. My friends who do re-tipping of nibs either re-tip steel nibs under protest, or do not attempt it at all. So if you are looking for a steel nib with a highly customized re-tip, it might be tougher to acquire than a gold one. The last item to cover will be at the risk of being a little self-promotional. This is regarding the fact that all nibs from the Edison Pen Company are tuned by me personally before shipping, whether they are steel or gold. Every nib is inspected under magnification, adjusted if needed, and then dipped in ink. The nib is then tested on quality paper to bring the nib specifically to the customer’s wishes. The pen is then flushed and allowed to dry before shipping. With customized nibs, every customer will receive a writing sample showing the performance of their nib when it left my studio. So every Edison Pen, regardless whether it is steel of gold, will write out-of-the box to your preferences. I hope that this article sheds new light on the usage of steel nibs in modern pens. I feel that steel nibs can get an undeserved bad standing in the fountain pen community. With the price of gold at an all-time high, I encourage pen consumers to re-evaluate usage of steel nibs. With the exception of flex, well-tuned steel nibs can offer a wonderful writing experience at a much lower cost.